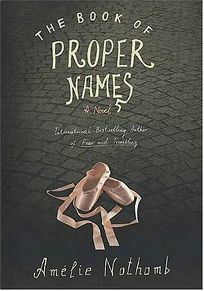 Pregnant, insomniac Lucette combs an old encyclopedia for an original and fortifying name to protect her future daughter against life's woes in Am lie Nothomb's brief, unorthodox French bestseller The Book of Proper Names. Years after Lucette's suicide, her daughter, Plectrude, blossoms into a bewitching dancer. But the Paris Opera's school for ballerinas, which she enters at age 13, threatens to stifle her playful imagination despite her talisman name. Nothomb crafts this unconventional coming-of-age tale in charmingly concise prose, translated from the French by Shaun Whiteside. .